Two times each day- rest time and before bed- the big girls have free reading time. Rebekah usually picks up her favorite picture books or transitional readers, but she has not yet chosen to read a chapter book. One of her biggest difficulties is tracking words, so the amount of words per page in a chapter book was daunting. A few weeks ago after we listened to several Magic Treehouse recordings, Rebekah began choosing Magic Treehouse books from the library however, she didn’t really read the books, just glanced through them. Then yesterday that suddenly changed. She choose a Magic Treehouse book for her bedtime reading and this time she began to read it! And once she started she couldn’t stop. When it was time for lights out she begged to finish her chapter. Then, she came down the stairs this morning reading as she walked, and she continued to read as she ate her breakfast. 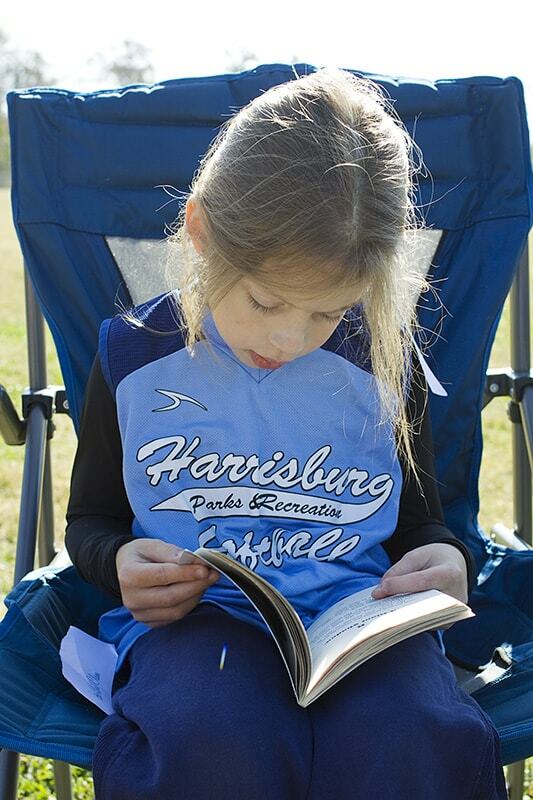 The book came in the car and to Michael’s football game, where she finished it not even 24 hours after starting! I’m so proud of her and she is so excited about her accomplishment. She can’t wait to start reading the next one.